Containment Protocols: Any manifesting instances of RPC-111 are to be shut down by Authority personnel as soon as possible. RPC-111 "branding" is to be removed by force from all parts of the surrounding area, and the gas station is to remain closed under the premise of a "catastrophic gas leak". 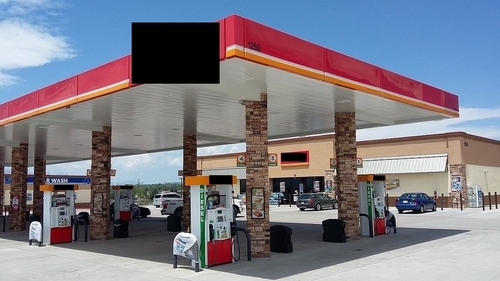 Nearby gas station employees reported, at any point, to have been peddling RPC-111's services are to be administered Class C amnestics immediately. All products, receipts, or other documentation obtained by unauthorized personnel are to be confiscated by Authority personnel and incinerated immediately. In the event of containment failure, all known customers of said RPC-111 instance and all individuals within a 150km radius of the location of the instance are to be given Class C amnestics. Funding is to be provided to local governments to construct buildings onto the remains of RPC-111. Any such building must be unable to sell fuel. All news articles about the incident are to be kept strictly local and are to be edited to report the RPC-111 instance as belonging to the previous chain, before transformation into an RPC-111 instance. RPC-111 will randomly replace existing gas stations across its area of activity. Upon manifestation, all gas stations within a 10km radius of the RPC-111 instance will begin to either exhibit fuel dispenser failures, increased gas prices, or purposefully-underperforming staff. Employees will do this in an attempt to promote RPC-111's services to those dissatisfied with the service at the employees' respective gas station. The result of this will usually be a massive influx of business transferring over to RPC-111 instances. RPC-111 instances will also produce anomalous humanoid creatures to staff it, referred to as RPC-111-1. What happens to the previous employees of the gas station is unknown. Instances of RPC-111-1 stand at an average height of 2.12 meters and are visually identical to humans, wearing the uniforms of the gas station chain before RPC-111 transformation. However, RPC-111-1 instances lack notable facial characteristics, such as hair, ears, or noses. While RPC-111-1 instances posess eye sockets and a mouth, they are devoid of eyeballs or teeth. These holes seemingly absorb 99% of incoming light, making them appear pitch black. The mouth of RPC-111-1 is fixed in an unmoving and unnaturally-wide smile. RPC-111-1 instances seemingly communicate to customers of RPC-111 instances telepathically. Prior interviews indicate that these "employees" will frequently coerce attending customers to purchase goods from RPC-111 instances, insinuating that they "never have enough stuff" and frequently remarking "Where else would they spend that money?" RPC-111-1 instances can be easily coerced into Authority possession, however separation from RPC-111 for more than one hour will result in their sudden sublimation. As such, information gathered from RPC-111-1 instances is extremely scarce. If RPC-111-2 turns down the prize, RPC-111-2's head will immediately explode. It is unknown how this occurs, but it is instantaneous and unable to be prevented. If the prize is accepted, the RPC-111 instance will explode with an approximate yield of 100 kilotons,5 flattening everything within a 1 km radius and killing any life forms within the same range. All instances of RPC-111-1 will spontaneously combust and home in on any other gas station in a 10 km radius by sprinting at approximately 100 km/h in an attempt to catch the station on fire and make it explode with a similar explosive force. Whether successful or not, all RPC-111-1 instances will disappear within one hour of their respective RPC-111 instance exploding. No traces of the RPC-111 instance will exist after two hours of initial detonation. RPC-111 has been responsible for approximately ███ fatalities and the loss of ███████ square kilometers of land. It has additionally contributed to numerous economic fluctuations. Since its discovery, ██ gas stations have been converted into RPC-111 instances, and █ have been destroyed by ignited RPC-111-1 instances. At the current rate of RPC-111 manifestation, gas stations will become so infrequent that gas-powered vehicles will become impractical in the United States by the year 2███. Foreword: The following is an interview conducted between Lead Researcher Dr. ██████ and an RPC-111-1 instance captured from an RPC-111 instance in [DATA EXPUNGED]. As RPC-111-1 instances cannot talk, Dr. ██████ wrote down RPC-111-1's telepathic statements. Dr. ██████: This is an interrogation of the captured RPC-111-1 instance. RPC-111-1— is there a name you'd rather go by? The RPC-111-1 instance shakes its head. Dr. ██████ writes down, "No, not that I can think of. Hopefully this won't take too long, I do have to go back to work, after all!" Dr. ██████: RPC-111-1, hopefully you won't mind me asking this question. What exactly are you? RPC-111-1 tilts its head to the side almost as if confused. Dr. ██████ jots down, "Isn't it obvious, Doc? I'm you're friendly local ████████ worker! I hope you're not thinking that we're trying to poison you or anything." Dr. ██████: No, not at all. Explain your history at… this company? RPC-111-1 leans back in its chair and glances up at the ceiling before sitting up and staring Dr. ██████ straight in the eyes. Dr. ██████ writes, "Well, I first went to a location over in [DATA EXPUNGED] after the BP station there ran out of gas. Silly folks over there can't even keep track of their own stock! No wonder I immediately fell in love with ████████! Pay practically half the price for better service." Dr. ██████: Let me stop you right there, RPC-111-1. It sounds like you were once a customer? RPC-111-1 again tilts its head to the side in confusion and begins convulsing. Security grows tense and moves closer to Dr. ██████, but they lower their guard two seconds later when RPC-111-1 stops. Dr. ██████ jots down, "Of course I was, Doc. What, do you think us ████████ workers grow on trees? Hahaha!" Dr. ██████: I apologize. Please, continue. RPC-111-1 glances off at the one-way mirror in the room before looking back at Dr. ██████. Dr. ██████ writes, "Anyways, I tried the SuperShake and immediately I knew that I'd be stopping there every single time I needed to fill up! Speaking of, have you bought a SuperShake yet? You really should. Won't hurt to tryyyy!" At this point, RPC-111-1 has started to melt. Bits of its forehead are dripping off its chin, however, RPC-111-1's expression remains unmoved. Dr. ██████: So… what happened after this? Not every customer becomes an employee. RPC-111-1 begins melting faster. As it does this, it places its left arm on the table. Its hand is missing three fingers, having already melted off. More researchers have entered the room and are frantically trying to scoop up liquid parts of RPC-111-1, but it keeps evaporating before they can secure a sample. Dr. ██████ scribbles, "Well, I thought about applying for a job. I WAS unemployed at the time, and who knows where my next paycheck was gonna come from. Luckily, ████████ noticed how many times I was stopping and shopping, because you can never have enough stuff, and they offered me a job before I could even ask if there were openings!" As Dr. ██████ is writing the previous statement down, he begins to put the pen down to ask the next question when RPC-111-1 starts twiddling what's left of its thumbs. Its left arm suddenly drops off, splashing onto the floor. Dr. ██████ immediately picks the pen again and jots down, "Look, I enjoy your company, but if you're not going to buy anything, then I need to get back to work." Dr. ██████: We only have a few more questions, don't worry. Please continue with your background. RPC-111-1 starts leaning forward, not of its own volition but because its spine has turned to liquid. As it hits the table, its head falls off and sits on the table top. "I wasn't sure, but they accepted anyways. I need to go." Dr. ██████: When did you start working at ████████? RPC-111-1's body rapidly sublimates. Telepathic signals grow slower. "E-ffec-tive im-me-di-ate-ly. I MUST go im-me-di-ate-ly." Dr. ██████: Do you remember anything before working at ████████? RPC-111-1 has melted to just a face lying on the table, rapidly evaporating. Dr. ██████ asks one more question. Dr. ██████: How did you learn you got accepted? As RPC-111-1 evaporates into nothing, the final telepathic signals come in intermittently as Dr. ██████ writes them down one word at a time. Closing Statement: Moments later, the RPC-111 instance that RPC-111-1 originated from detonated. Authority personnel were dispatched to stall any ignited RPC-111-1 instances from destroying any more gas stations. Despite loss of the RPC-111-1 instance, the interview was considered a success by Dr. ██████. 1. 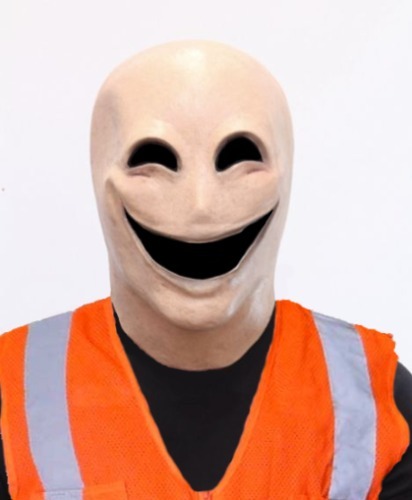 A cognitohazard that compels onlookers to stop and fill up their gas tank at the RPC-111 instance. 2. This value is in US Dollars. Current conversion rates are to be applied for values in Canadian Dollars/Mexican Pesos. 3. Authority GoIs are currently under investigation to search for any ties. 4. 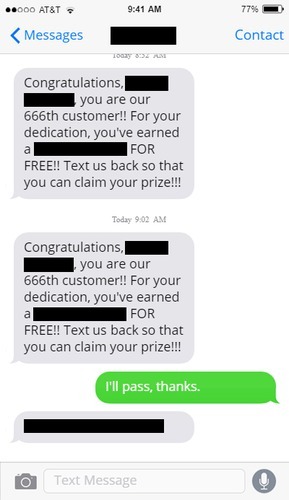 Approximately 99% of people who receive this message will decline the reward, while 1% will accept. 5. This is approximately five times the strength of the atomic bombs that ended WWII. However, the explosion does not cause any radioactive fallout.